November 29, 2016 – A laser-guided navigation sensor that could help future rovers make safe, precise landings on Mars or destinations beyond will soon undergo testing in California’s Mojave Desert. The NDL will be a part of a NASA payload called COBALT, or CoOperative Blending of Autonomous Landing Technologies, which has been a joint technology development effort between multiple NASA centers, including Langley, the Johnson Space Center (JSC) in Houston, Texas, and the Jet Propulsion Laboratory (JPL) in Pasadena, California. That’s where NDL comes in. 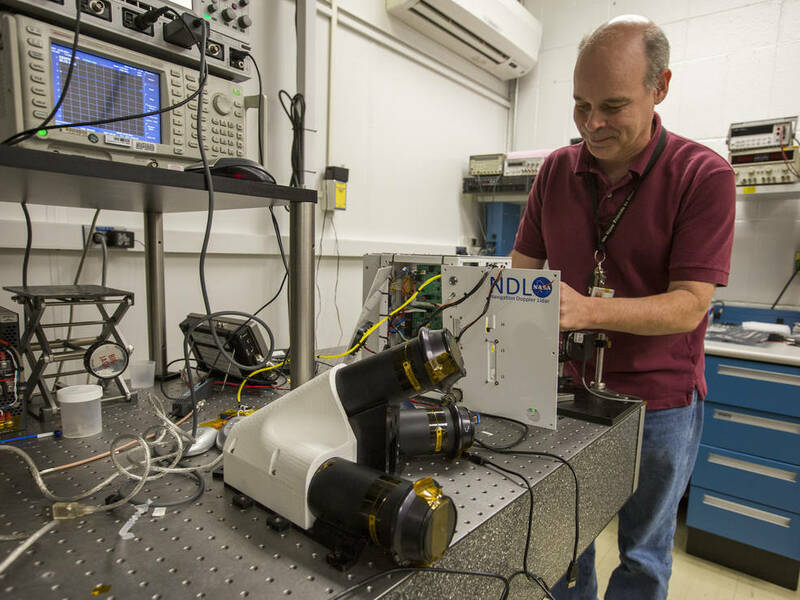 The unit is comprised of a small electronics box connected by fiberoptic cables to three lenses that transmit three laser beams. Those beams reflect off the ground to help the sensor determine its speed, direction and altitude. NDL’s ultra-precise velocity and range measurements are critical for highly controlled, very soft landings. 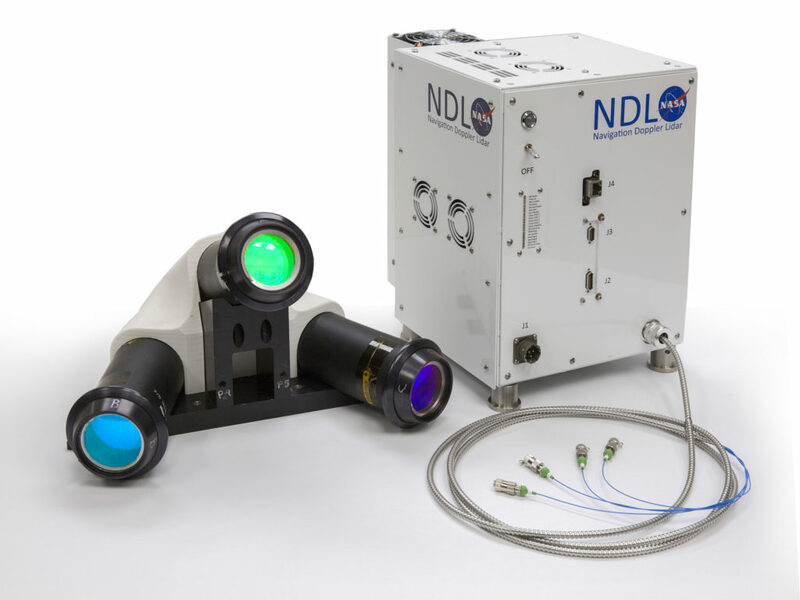 NDL works as a standalone unit, but for the COBALT flight tests onboard Xodiac, the NDL will be coupled with a Lander Vision System, or LVS, developed by NASA JPL. LVS will take pictures of the terrain and compare them with existing terrain maps in order to tell the lander where it is relative to its designated landing site. That type of technology is called Terrain Relative Navigation. NDL’s diminutive size gives it a significant advantage over previous lander technologies. In fact, it looks petite compared to the radar that helped the Curiosity rover land on Mars. That radar was a four-foot-long plate with electronics sticking out of the top and large antennas jutting out from the bottom. It will also weigh significantly less, “which is a huge deal,” said Amzajerdian. Researchers had success with an earlier, larger version of the NDL in 2014 as part of NASA’s Morpheus Project, which developed and tested a prototype planetary lander capable of vertical takeoff and landing. Amzajerdian believes NDL has the potential to be a standard sensor for all landing missions. Flight-testing of COBALT with NDL and LVS will involve team members from NASA JSC, Langley and JPL. The COBALT project was developed and is managed through NASA JSC, and the payload was designed and will be integrated by NASA JPL, which is also developing the navigation filter that fuses the NDL and LVS measurements. Through the Flight Opportunities program, the LVS has been tested on a Masten rocket-powered lander and validated for use on the Mars 2020 rover. COBALT is a collaborative effort between NASA’s Game Changing Development and Flight Opportunities programs, which are part of the Space Technology Mission Directorate, and the Advanced Exploration Systems program, which is part of the Human Exploration and Operations Mission Directorate.